For several reasons most service desks have immature processes. The immaturity is present from hiring, onboarding, training, and documentation through incident, change and request processes. End user satisfaction is low as many are left confused or unhappy with the experience. Ineffective demand planning leads recurring issues. Lack of good tools and automation leads to a brute force labor strategy keeping costs high. Metrics are not in place, accountability is low, and there is little control over time and action. 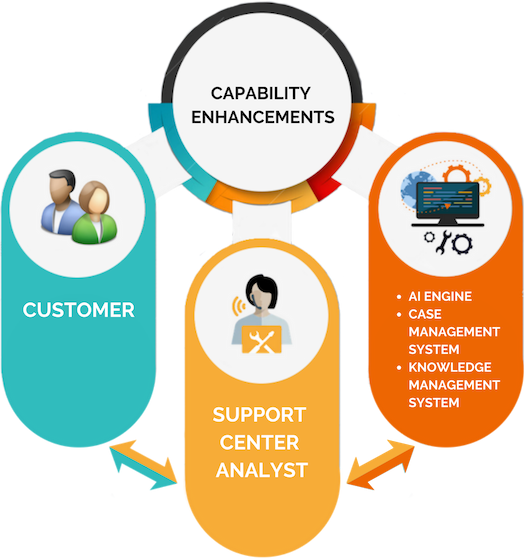 The service desk is a primary interface between end users and IT. IT fails to make the case for or the business does not provide for enough resources in time, talent and tools to drive quality improvements. Over time performance is static or degenerative. The lack of centers of excellence around service desk management has kept the maturity of most desks low. Centralizing ticket input reduces chaos and disruption. Identifying demand on the service desk enables the business to choose the level of response they want. A service desk is no different than a pipeline in one characteristic, you can only pump as much through it as the size allows. Tooling and automation reduces MToE (mean time of effort) per ticket. Root cause analysis and updates to the Knowledge Base (KB) reduces the number of tickets. Continual Service Improvement and frequent CSI cycles reduce the number of incidents and the average time per incident. Successful organizations have reduced service desk staff as much as 40% with UX metrics beyond the 90th percentile. Those organizations that have successfully matured their service desks, have begun to look for ways to leverage machine learning and artificial intelligence. For those with enterprise ITSM solutions, a number of ML/AI tools are now commercially available. These can provide more options for self-service, improve quality (First Call Resolution or FCR), and reduce MToE. Combining knowledge management (KM) and artificial intelligence (AI) tools has been proven to increase human performance. The result is increased quality and decreased contact processing time (time to issue resolution). It also does not have to remove the role of the analyst. It makes simply makes them more effective and more efficient. Providing your employees with self-service tools that eliminate the need to contact the support center is the goal of automation. Your bank’s ATM uses the same approach. We all find it faster and easier than going into the branch. Look at task automation as replacing any task that is performed manually and performing the task by using technology to automate or eliminate it. Your employees want to get back to work, and they will take the fastest and easiest patch. If servicing themselves through automation is better and faster than calling the service desk and speaking to an analyst, then that’s what they’ll do. Many organizations see the service desk as an expense to be controlled and decreased through aggressive cost management. However, the service desk has a substantial impact on how fast your employees can get back to work, and how they feel about their company. The quality and performance of the service desk says a lot about a company’s vision and their level of management and operational sophistication. One approach is to use poorly trained staff with minimal tools to “just handle the ticket”. These companies are communicating to their IT team and their employees that excellence is not expected, and their satisfaction is less important than the dollar. There are many qualitative costs this legacy view fails to account for. A better, more modern approach is to use training and technology to enable customer-centric processes that both improve service quality and control costs. These firms are saying to IT and their employees that they expect and deliver excellence, and this becomes a key competitive advantage in retaining their best and brightest employees. Their vision for the service desk is to drive technology and process to serve their employees and empower service desk members. Reach out to us and let’s discuss how we can help you achieve excellence.